Since the passage of President Obama’s 2010 health care law, the Republican-controlled House has voted 40 times to repeal all or part of it. Now, some Republicans have declared themselves still intent on rolling back the law, with one strategy being to de-fund it as part of legislation needed to keep the government running after Oct. 1. As the Oct. 1 launch date approaches under the Affordable Care Act for setting up health insurance marketplaces where uninsured people can shop for coverage, a Kaiser Health Tracking Poll finds about half (51%) of those surveyed say they don’t have enough information about the ACA to understand how it will impact them and their families. But the survey, conducted Aug. 15-18, also finds that 44% of Americans are unsure whether ACA remains the law. About three-in-ten (31%) say they don’t know, while 8% think it has been repealed by Congress and 5% believe it was overturned by the Supreme Court (which upheld the law in June by a 5-to-4 decision). 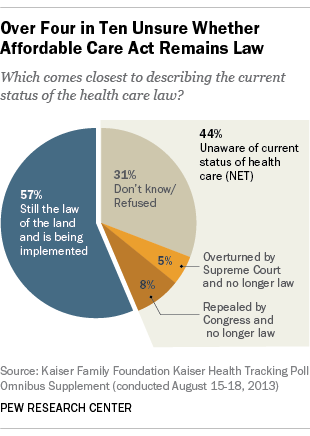 While the Kaiser poll found that overall opinion on the law continued to “tilt negative” in August, with 42% seeing it unfavorably and 37% having a favorable view, a majority (57%) of Americans disapproved of the idea of cutting off funding as a means of stopping the law from being put into effect.